This tutorial shows how to build an NLP project with TensorFlow that explicates the semantic similarity between sentences using the Quora dataset. It is based on the work of Abhishek Thakur, who originally developed a solution on the Keras package. This article is an excerpt from a book written by Luca Massaron, Alberto Boschetti, Alexey Grigorev, Abhishek Thakur, and Rajalingappaa Shanmugamani titled TensorFlow Deep Learning Projects. The data, made available for non-commercial purposes (https://www.quora.com/about/tos) in a Kaggle competition (https://www.kaggle.com/c/quora-question-pairs) and on Quora’s blog (https://data.quora.com/First-Quora-Dataset-Release-Question-Pairs), consists of 404,351 question pairs with 255,045 negative samples (non-duplicates) and 149,306 positive samples (duplicates). There are approximately 40% positive samples, a slight imbalance that won’t need particular corrections. Actually, as reported on the Quora blog, given their original sampling strategy, the number of duplicated examples in the dataset was much higher than the non-duplicated ones. In order to set up a more balanced dataset, the negative examples were upsampled by using pairs of related questions, that is, questions about the same topic that are actually not similar. Before starting work on this project, you can simply directly download the data, which is about 55 MB, from its Amazon S3 repository at this link into our working directory. How does Quora quickly mark questions as needing improvement? before I have time to give it details? Why did Trump win the Presidency? How did Donald Trump win the 2016 Presidential Election? What practical applications might evolve from the discovery of the Higgs Boson? What are some practical benefits of the discovery of the Higgs Boson? At first sight, duplicated questions have quite a few words in common, but they could be very different in length. Who should I address my cover letter to if I’m applying to a big company like Mozilla? Which car is better from a safety persepctive? swift or grand i10. My first priority is safety? Mr. Robot (TV series): Is Mr. Robot a good representation of real-life hacking and hacking culture? Is the depiction of hacker societies realistic? What mistakes are made when depicting hacking in Mr. Robot compared to real-life cyber security breaches or just a regular use of technologies? How can I start an online shopping (e-commerce) website? Which web technology is best suited for building a big e-commerce website? Some questions from these examples are clearly not duplicated and have few words in common, but some others are more difficult to detect as unrelated. For instance, the second pair in the example might turn to be appealing to some and leave even a human judge uncertain. The two questions might mean different things: why versus how, or they could be intended as the same from a superficial examination. Looking deeper, we may even find more doubtful examples and even some clear data mistakes; we surely have some anomalies in the dataset (as the Quota post on the dataset warned) but, given that the data is derived from a real-world problem, we can’t do anything but deal with this kind of imperfection and strive to find a robust solution that works. Question 1 and question 2 are roughly the same average characters, though we have more extremes in question 2. There also must be some trash in the data, since we cannot figure out a question made up of a single character. The presence of word sequences such as Hillary Clinton and Donald Trump reminds us that the data was gathered at a certain historical moment and that many questions we can find inside it are clearly ephemeral, reasonable only at the very time the dataset was collected. Other topics, such as programming language, World War, or earn money could be longer lasting, both in terms of interest and in the validity of the answers provided. After exploring the data a bit, it is now time to decide what target metric we will strive to optimize in our project. Throughout the article, we will be using accuracy as a metric to evaluate the performance of our models. Accuracy as a measure is simply focused on the effectiveness of the prediction, and it may miss some important differences between alternative models, such as discrimination power (is the model more able to detect duplicates or not?) or the exactness of probability scores (how much margin is there between being a duplicate and not being one?). We chose accuracy based on the fact that this metric was the one decided on by Quora’s engineering team to create a benchmark for this dataset (as stated in this blog post of theirs: https://engineering.quora.com/Semantic-Question-Matching-with-Deep-Learning). Using accuracy as the metric makes it easier for us to evaluate and compare our models with the one from Quora’s engineering team, and also several other research papers. In addition, in a real-world application, our work may simply be evaluated on the basis of how many times it is just right or wrong, regardless of other considerations. We can now proceed furthermore in our projects with some very basic feature engineering to start with. As we will be using each one of these packages in the project, we will provide specific instructions and tips to install them. We will be using the pandas dataframe denoted by data , and also when we work with our TensorFlow model and provide input to it. This simple approach will help you to easily recall and combine a different set of features in the machine learning models we are going to build, turning comparing different models run by different feature sets into a piece of cake. The next set of features are based on fuzzy string matching. Fuzzy string matching is also known as approximate string matching and is the process of finding strings that approximately match a given pattern. The closeness of a match is defined by the number of primitive operations necessary to convert the string into an exact match. These primitive operations include insertion (to insert a character at a given position), deletion (to delete a particular character), and substitution (to replace a character with a new one). Fuzzy string matching is typically used for spell checking, plagiarism detection, DNA sequence matching, spam filtering, and so on and it is part of the larger family of edit distances, distances based on the idea that a string can be transformed into another one. It is frequently used in natural language processing and other applications in order to ascertain the grade of difference between two strings of characters. It is also known as Levenshtein distance, from the name of the Russian scientist, Vladimir Levenshtein, who introduced it in 1965. These features were created using the fuzzywuzzy package available for Python (https://pypi.python.org/pypi/fuzzywuzzy). This package uses Levenshtein distance to calculate the differences in two sequences, which in our case are the pair of questions. Now the returned value is 57. Using the partial_ratio method, we can observe how the difference in scores for these two pairs of questions increases notably, allowing an easier discrimination between being a duplicate pair or not. We assume that these features might add value to our models. Again, we will store our work and save it for later use when modeling. Without any prior knowledge, other than about the documents themselves, such a score will highlight all the terms that could easily discriminate a document from the others, down-weighting the common words that won’t tell you much, such as the common parts of speech (such as articles, for instance). It must be noted that the parameters shown here have been selected after quite a lot of experiments. These parameters generally work pretty well with all other problems concerning natural language processing, specifically text classification. One might need to change the stop word list to the language in question. In our TFIDF processing, we computed the TFIDF matrices based on all the data available (we used the fit_transform method). This is quite a common approach in Kaggle competitions because it helps to score higher on the leaderboard. However, if you are working in a real setting, you may want to exclude a part of the data as a training or validation set in order to be sure that your TFIDF processing helps your model to generalize to a new, unseen dataset. After we have the TFIDF features, we move to SVD features. SVD is a feature decomposition method and it stands for singular value decomposition. It is largely used in NLP because of a technique called Latent Semantic Analysis (LSA). To create the SVD features, we again use scikit-learn implementation. This implementation is a variation of traditional SVD and is known as TruncatedSVD. Feature set-3 is derived from a combination of these TF-IDF and SVD features. For example, we can have only the TF-IDF features for the two questions separately going into the model, or we can have the TF-IDF of the two questions combined with an SVD on top of them, and then the model kicks in, and so on. These features are explained as follows. We can similarly create a couple more combinations using TF-IDF and SVD, and call them fs3-4 and fs3-5, respectively. These are depicted in the following diagrams, but the code is left as an exercise for the reader. After the basic feature set and some TF-IDF and SVD features, we can now move to more complicated features before diving into the machine learning and deep learning models. Very broadly, Word2vec models are two-layer neural networks that take a text corpus as input and output a vector for every word in that corpus. After fitting, the words with similar meaning have their vectors close to each other, that is, the distance between them is small compared to the distance between the vectors for words that have very different meanings. Nowadays, Word2vec has become a standard in natural language processing problems and often it provides very useful insights into information retrieval tasks. For this particular problem, we will be using the Google news vectors. 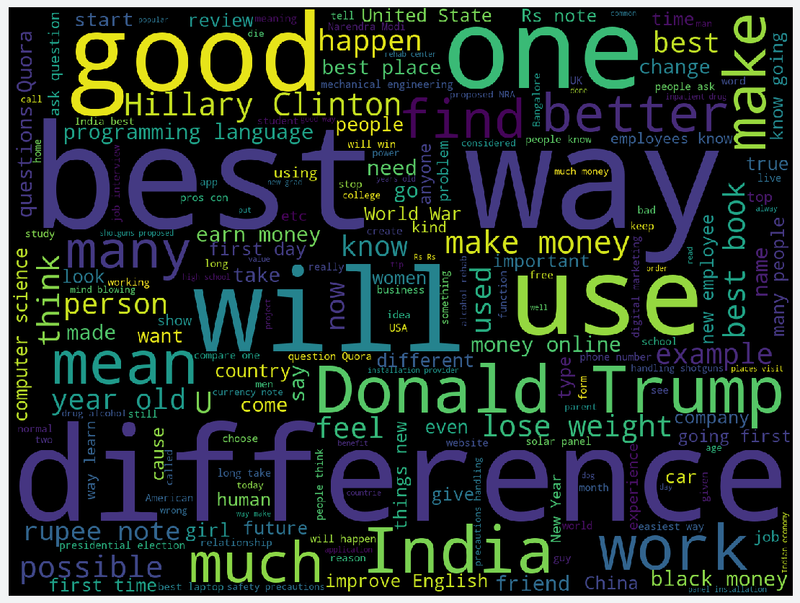 This is a pretrained Word2vec model trained on the Google News corpus. All the words in this example, such as Germany, Berlin, France, and Paris, can be represented by a 300-dimensional vector, if we are using the pretrained vectors from the Google news corpus. 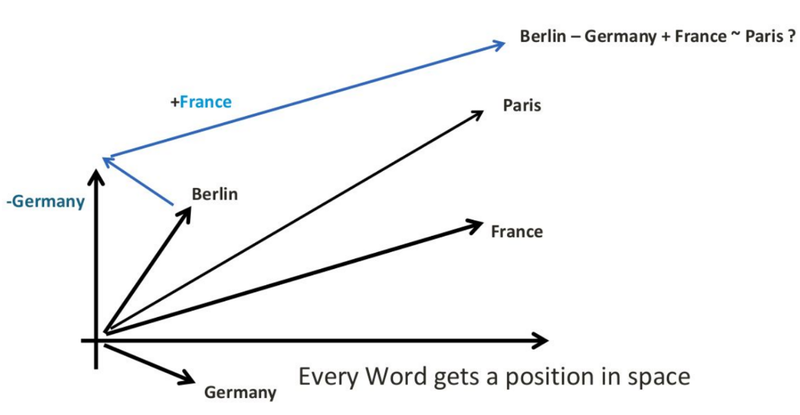 When we use Word2vec representations for these words and we subtract the vector of Germany from the vector of Berlin and add the vector of France to it, we will get a vector that is very similar to the vector of Paris. The Word2vec model thus carries the meaning of words in the vectors. The information carried by these vectors constitutes a very useful feature for our task. Now, we can easily get the vector of a word by calling model[word]. However, a problem arises when we are dealing with sentences instead of individual words. In our case, we need vectors for all of question1 and question2 in order to come up with some kind of comparison. For this, we can use the following code snippet. The snippet basically adds the vectors for all words in a sentence that are available in the Google news vectors and gives a normalized vector at the end. We can call this sentence to vector, or Sent2Vec. When the phrase is null, we arbitrarily decide to give back a standard vector of zero values. 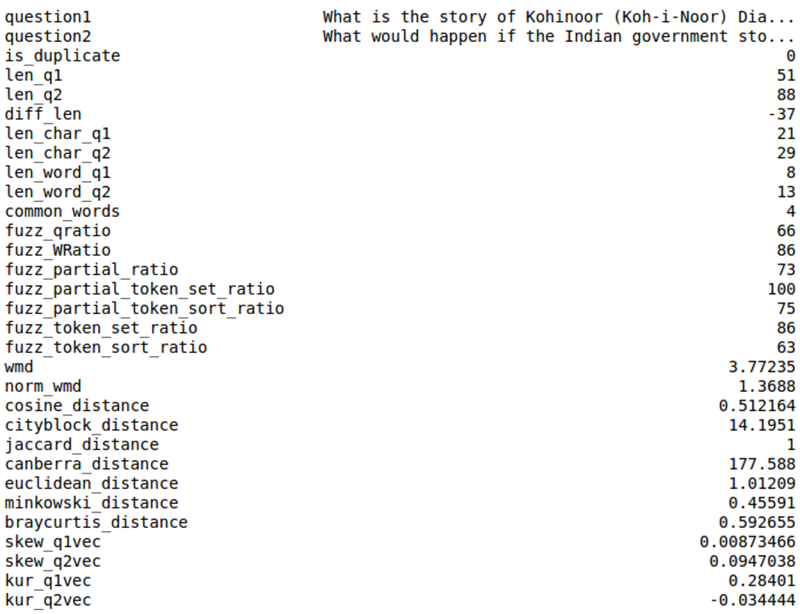 To calculate the similarity between the questions, another feature that we created was word mover’s distance. Word mover’s distance uses Word2vec embeddings and works on a principle similar to that of earth mover’s distance to give a distance between two text documents. Simply put, word mover’s distance provides the minimum distance needed to move all the words from one document to another document. All the Word2vec features are denoted by fs4. Let’s train some machine learning models on these and other Word2vec based features. * = These models were not trained due to high memory requirements. We can treat the performances achieved as benchmarks or baseline numbers before starting with deep learning models, but we won’t limit ourselves to that and we will be trying to replicate some of them. We are going to start by importing all the necessary packages. As for as the logistic regression, we will be using the scikit-learn implementation. The xgboost is a scalable, portable, and distributed gradient boosting library (a tree ensemble machine learning algorithm). Initially created by Tianqi Chen from Washington University, it has been enriched with a Python wrapper by Bing Xu, and an R interface by Tong He (you can read the story behind xgboost directly from its principal creator at homes.cs.washington.edu/~tqchen/2016/03/10/story-and-lessons-behind-the-evolution-of-xgboost.html ). The xgboost is available for Python, R, Java, Scala, Julia, and C++, and it can work both on a single machine (leveraging multithreading) and in Hadoop and Spark clusters. The installation of xgboost on both Linux and macOS is quite straightforward, whereas it is a little bit trickier for Windows users. After a while (the solver has a maximum of 1,000 iterations before giving up converging the results), the resulting accuracy on the validation set will be 0.743, which will be our starting baseline. Now, we try to predict using the xgboost algorithm. Being a gradient boosting algorithm, this learning algorithm has more variance (ability to fit complex predictive functions, but also to overfit) than a simple logistic regression afflicted by greater bias (in the end, it is a summation of coefficients) and so we expect much better results. We fix the max depth of its decision trees to 4 (a shallow number, which should prevent overfitting) and we use an eta of 0.02 (it will need to grow many trees because the learning is a bit slow). We also set up a watchlist, keeping an eye on the validation set for an early stop if the expected error on the validation doesn’t decrease for over 50 steps. It is not best practice to stop early on the same set (the validation set in our case) we use for reporting the final results. In a real-world setting, ideally, we should set up a validation set for tuning operations, such as early stopping, and a test set for reporting the expected results when generalizing to new data. The final result reported by xgboost is 0.803 accuracy on the validation set. The deep learning models in this article are built using TensorFlow, based on the original script written by Abhishek Thakur using Keras (you can read the original code at https://github.com/abhishekkrthakur/is_that_a_duplicate_quora_question). Keras is a Python library that provides an easy interface to TensorFlow. Tensorflow has official support for Keras, and the models trained using Keras can easily be converted to TensorFlow models. Keras enables the very fast prototyping and testing of deep learning models. In our project, we rewrote the solution entirely in TensorFlow from scratch anyway. To summarize, we built a model with the help of TensorFlow in order to detect duplicated questions from the Quora dataset. To know more about how to build and train your own deep learning models with TensorFlow confidently, do checkout this book TensorFlow Deep Learning Projects.